The Wyvern is one of Guild Wars 2’s newest faces and as we previewed several weeks ago, it’s an encounter that’s designed to test players more than most enemy encounters. Guild Wars 2 is known for lacking particularly challenging content so can this winged beast change that? Before I discuss the difficulty of the Wyvern, I’d have to say that’s it’s visually one of the most impressive bosses in all of Guild Wars 2. It looks stunning and the new fire effects are incredible. When you see it soar through the sky before sending a jet of fire across the platform it’s hard not to get excited. Once it’s landed, you also quickly realise that condition removal and burning are your new best friends. For demo purposes the journey to the Wyvern encounter is actually shortened. A hop onto an awaiting Transport and you’re quickly staring down at the platform you need to land on. Leaping off the edge and opening up you wings was a giddy moment and something I’ve never noticed before is just how beautiful the starting set are. They actually shimmer as you move and are a variety of subtle colours that catch the light. Sadly the descent doesn’t last long and before you know it, you’re landing and staring at the Wyvern. The platform is surprisingly large and if you were a Ranger, you could comfortably avoid all the Wyvern's flame attacks while hitting him. For professions who don’t have such range luxuries, as I later discovered, attacking the Wyvern in melee is incredibly difficult. Whether it’s his flame breath that coats the ground around him to drastically limit your movement or his winged buffet that violently blasts you back, you have to concentrate on your positioning when fighting or you’ll quickly die. I found that attacking the Wyvern from behind, near to his tail, allowed me to deal a lot of damage quickly. Unfortunately for me he’d often spin around and burn the ground where I was once stood, giving me no option but to run away. I got caught by his flames many times and was often frantically switching back to Jalis to cleanse the burning. One of the main challenges with the Wyvern, outside of his ability to melt your face, is his wing attack. At certain points he’ll stand on his hind legs and blast you back with gusts of air. What makes this part of the fight particularly challenging is the fact that Stability is now incredibly difficult to time. Considering the buff no longer lasts for lengthy periods of, timing your skills to gain stability long enough not to be blown off your feet proved very difficult. Perhaps it’s more a case of it affecting the Revenant, but I found it particularly difficult to cast Inspiring Reinforcement quick enough to gain the stacks of Stability I needed. An easier solution was to simply run away frantically. If you do end up getting knocked off the platform you can simply use your wings to fly towards an updraft of air that’ll send you zipping back onto the platform. I also found that jumping off the platform to utilise these updrafts is a good way of quickly reposition yourself away from the Wyvern. If you manage to survive the both the burning and the winged buffet, he’ll attempt to take to the air to bombard you from above. It’s at this stage that players can make use of the new Defiance mechanic and attempt to shatter his Breakbar. With the amount of players we had fighting against the Wyvern (around 18) it wasn’t too difficult to prevent his flight. As our numbers reduced for future fights (3 to 5 players) it was incredibly challenging. Multiple times during the smaller scale encounters with the Wyvern we failed to prevent him taking to the sky. At that point his aerial attacks caught a few of us off guard. Could the fight have been more difficult? I think so and having spoken to Isaiah Cartwright after my hands on time, he assured me the difficulty had be toned down for the demo. If there’s anything else that could make the fight more difficult it would probably be to stop the NPC’s on the platform resurrecting downed players. From what I could tell they were immune to the damage of the Wyvern so it made it a little to easy to get back up and if I did die, I’d simply Waypoint and fly back onto the platform. I’d actually like to see that Waypoint become contested when the fight starts and have the NPC’s be removed. Better yet, if ArenaNet could make it so players had their wings set on fire so that they can’t always fly back onto the platform it would add greater difficulty that I think the encounter needs. 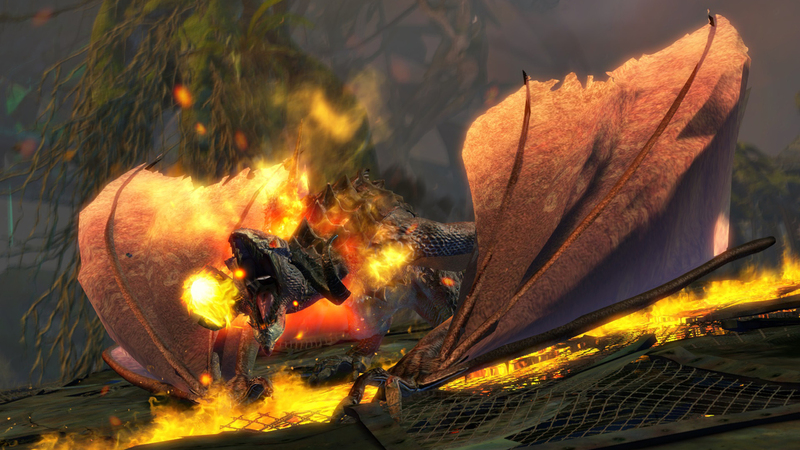 Having said all that, the Wyvern is one of many new enemy encounters in Guild Wars 2: Heart Of Thorns and they all have to vary in difficulty. The Wyvern is a brilliant start and I can’t wait to face it on a smaller platform. Enjoyed reading this? Check out our Revenant Hands-On Impressions!